So guess what? I’ve made it to the fourth and final round of the Marx Foods Ridiculously Delicious Challenge! Whee! As part of the final round, a super secret mystery ingredient was overnighted to me. If you follow my Tweets, you’ll have read my guesses on what it could be. Well, guess no longer – the secret ingredient is WASABI! That’s right, kiddos – wasabi as an ingredient is usually quite expensive, so you are often dipping your sushi into a mix of horseradish, mustard and food coloring instead of actual wasabi (just check out the ingredients on your typical wasabi tube). But I’m not working with horseradish here – Marx Foods sent over three rhizomes of green daruma wasabi. Nuanced, delicate and slightly sweet, daruma wasabi is heads and shoulders above the horseradish mix. I’ve only had authentic wasabi two times in my life – and it was life-changing! If you ever have the chance, you’ve GOT to try it. 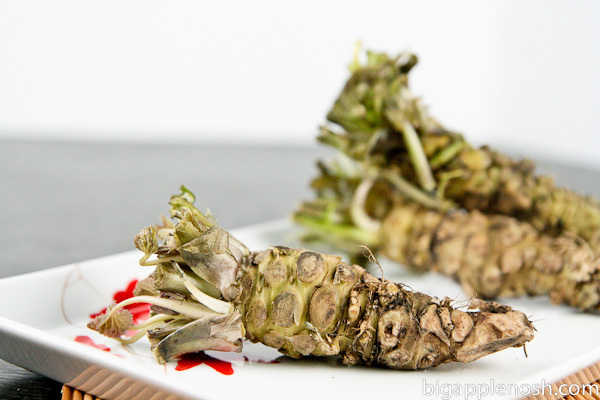 Wasabi is not the easiest ingredient to use or store – right now, the three rhizomes are resting in damp towels in the fridge, and I need to check on them periodically. But I am so excited to create a recipe using this hard-to-find ingredient – I already have a few ideas in mind! So stay tuned; I’ll be going wasabi-crazy in the next week or so! Are you a wasabi fan? Mmm! HUGE FAN! I was a waitress at a Japanese restaurant in college and they used to fresh grind the wasabi every day…the guy that did it wore a mask and gloves…I hope you have some sort of equally awesome face/hand protection? OOOOOOOwie! I can't wait to see what you come up with with one of my fave ingredients! Ah! I can't wait to see how you use them. Yay! I can't wait to see what you decide to make. I know you've already made spicy chocolate, but Vosges makes an amazing wasabi chocolate bar – it's so yummy! I'm totally a wasabi fan! And this amazes me at how crazy actual wasabi looks! Never would have guessed it! Can't wait to see what you come up with! Congrats on getting to round 4 and can't wait to see what your next concoction is! Granted, not all sushi restaurants serve the horseradish mix (case in point the place Cathleya used to work at), but I've had many a dyed-green paste next to my Sushi Combo A! That being said, I am a HUGE fan on wasabi and I can't wait to see what you come up with! Best of luck! Geek in Heels – thanks for your super-sweet comment! To be honest, I'm learning as I go when it comes to cooking (I'm more of a baker) so please don't be intimidated! I don't know what I'm doing, ha! I'd LOVE to try some Korean recipes though – thus far, I'm more of a consumer of Korean food than making it. so exciting! congrats on getting to the next round, and i'm positive that you're going to come up with something awesome for the wasabi. wow that looks like a huge challenge. Thanks for informing us that wasabi from the tube is not real wasabi. I'm glad I know. I can't wait to see what you do with the wasabi! To be honest, I don't know if I have ever tried the real deal. My assumption is that most restaurants around here just use the powder stuff. So exciting!! I've never had the real thing, but I would love to try it!! I can't wait to see what you do with it. Can't wait to see your recipe. I am a wasabi addict, but unfortunatelly I never tried the real deal. Wow! I had NO IDEA that that's what real wasabi looks like!!! Cool! I can't wait to see what you come up with. I've never had real wasabi before! very excited to see what you do with wasabi! i use it very little when eating sushi, but am very interested in seeing it in other dishes. So cool! I had no idea that most wasabi in sushi restaurant was fake. Crazy! I'm excited to see what you come up with. I am such a wimp when it comes to wasabi! It's really cool to see its true form though. What a neat challenge! Ohh I love Wasabi – can't wait to see what recipes you come up with! Big Apple Nosh: NYC Food Blog | New York | Food | Restaurants | Recipes | Reviews | NoshGirl Chef: WASABI! Food Blog: Big Apple Nosh | Kansas City | New York | Restaurants | Recipes | Reviews | Drive-by Post: Truffle Giveaway on the Marx Foods Site!